With it’s brushed red metal finish, this beautiful floating torch adds a natural and elegant ambiance that will astonish friends and fish alike. Available at The Home Depot. Add excitement to your pond or pool at night with the TotalPond® Metal Floating Lotus Torch. With it’s brushed red metal finish, this beautiful floating torch adds a natural and elegant ambiance that will astonish friends and fish alike. The torch can be tethered to easily position it within your pond or pool. It holds up to 3 ounces of torch fuel, creating a flame that lasts for hours. To repel mosquitoes and other flying insects, consider using citronella oil. 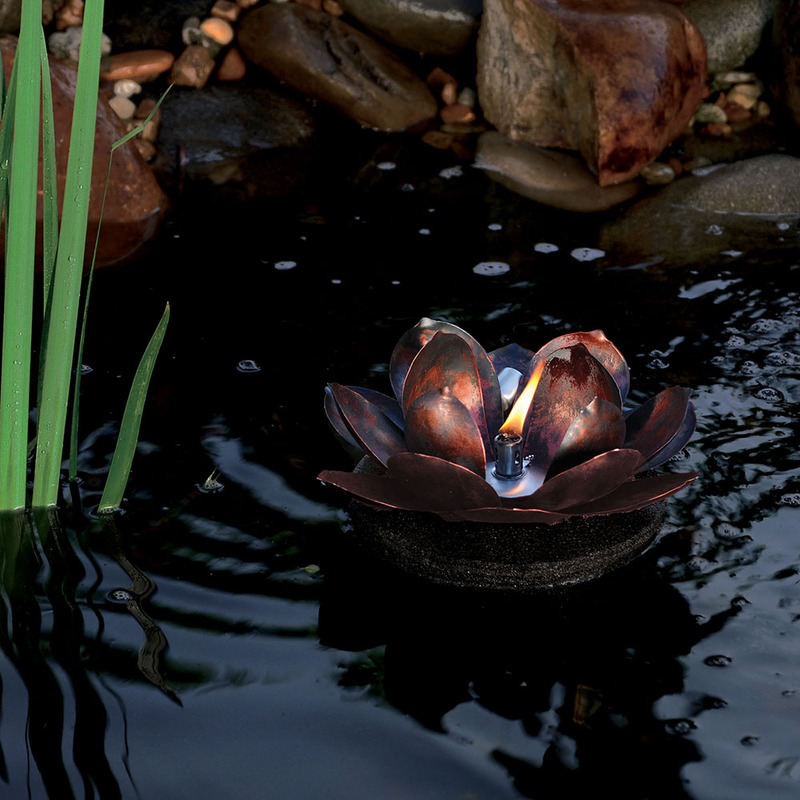 The Metal Floating Lotus Torch provide beautiful nighttime décor for ponds and pools. The floating torch includes a 3 oz. torch canister, a snuffer cap, a tether ring, a wick, a metal flame guard, and a float. With it’s weather-resistant, brushed-red metal finish, this beautiful floating torch adds a natural and elegant ambiance. Torch canister holds up to 3 oz. of torch fuel (not included). The snuffer cap protects the wick when the torch is not in use. The tether ring allows you to connect a tether (not included) to prevent the torch from floating to undesirable areas in your pond or pool. The black foam float keeps the lotus buoyant on the water's surface. The flame produced lasts up to 3 hours, pending fuel type and weather conditions. WARNING: This product, when used with fuel (not included), can expose you to chemicals including Methanol, which is known to the State of California to cause birth defects or other reproductive harm. See warnings on the fuel label. For more information go to www.P65Warnings.ca.gov. Dimensions: 11 x 11 x 5.75 in.